A new process from Quintus Technologies, high-pressure warm forming (HPWF), combines high pressure with a moderately elevated temperature and promises more rapid, cost-effective and precise forming of titanium parts. HPWF, according to Quintus officials, paves the way for more widespread adoption of Ti-6Al-4V, a titanium alloy prized in manufacturing for its high strength, light weight, formability, and high corrosion resistance. HPWF reportedly removes barriers to fabrication that previously limited the use of Ti-6Al-4V to specialty applications due to the high cost of current forming methods. The scrap rate for conventional milling can approach 70 percent, and hot-forming processes, where temperatures surpass 1300 F, require an oxygen-free process atmosphere and entail several steps. 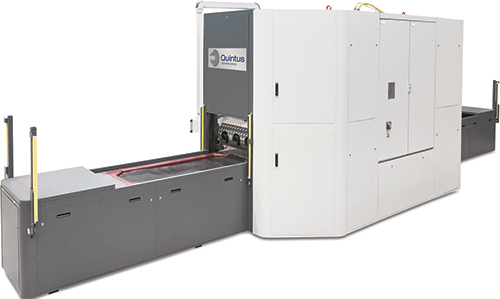 HPWF significantly improves on these methods, claim company officials, by introducing an induction-heating system to warm the blank-and-tool package to approximately 520 F—well below temperatures requiring a protective gas—just before entering a Quintus Flexform press. The press applies uniform high pressure (20,000 psi) to a flexible rubber diaphragm in conjunction with only a single rigid tool half to form complex sheetmetal parts to final shape. A complete HPWF cycle, from heating and loading to forming and unloading, reportedly takes less than 5 min., and forming at relatively low temperatures enables quick cooling. Overall, efficiencies generated by the new process dramatically boost the production capacity for Ti-6Al-4V parts, increasing throughput by a factor of five over traditional hot-forming processes, report Quintus officials.